Anyone want to talk about the Oscars? There were some historic wins by artists of color (including an Oscar for Spike Lee and several for Black Panther) but it sounds like The Green Book winning best picture was an extreme disappointment. I didn’t see the movie, so would love to hear opinions from those who did. The fact that the family of the subject denounced the movie made me less interested in it. But it will still go on my watch list at some point. I think most disappointment stems that it is another movie about a "white savior" with light talk about racism. So, in short, a film made by white men that lightly touches on the subject and gets hailed as a great movie while movies made by actual PoC continues to get pushed by the wayside. The easy answer as to why Green Book remained so popular, all awards season long, has been that it lets white folks off the hook for whatever responsibility we bear for the crushing weight of systemic racism. And I think this is generally true. It is, after all, a movie in the rough genre of Driving Miss Daisy and other tales of respectability politics, where good-hearted, saintly black folks teach coarser, prejudiced white people that it’s okay to embrace people of other races. What’s interesting is just how rooted these films remain in the 1950s and ’60s, no matter how far we travel from the civil rights era. Gentleman’s Agreement is not, to my mind, a great film, but it was about a contemporary problem in a way that so many of the films that followed in its footsteps just aren’t. Both Driving Miss Daisy and Green Book relegate racism to the past, making it a problem that has been dealt with. You can see where that message would be particularly alluring to white people. Please note that the article goes on to say that it's more complicated than trying to put racism in the past, so well worth a read. Anyone want to talk about the Oscars? 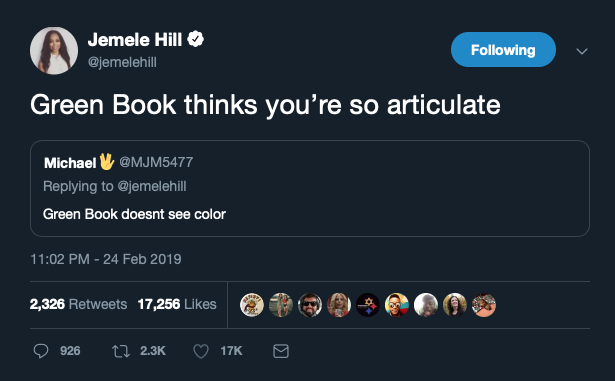 Jemele Hill's Twitter thread on Green Book is outstanding. And then it really gets going. So the green book was a ok movie for me at first. The one main problem I had with it was I didn't buy the racist guy's turn around at the end. Then I learned of the controversy which brought the movie down more for me. I see it as one of those movies that many people see as oscar worthy and many people see as pandering. In this case I see it as white savior movie that gets some things wrong. A minor example of something wrong without spoiling the movie was that all green book places were crappy. They were just places black people could go. Some of the places were upscale or just average. For a movie called green book and to get that detail wrong says something. I will say that we ignored the Oscars, like most every year. I really can't fathom why they matter to anyone outside of the filmmakers and everyone that works on films. The awards have no impact on what movies I see or how much I enjoy them. That said, I am kinda bummed I did not see Spike Lee finally get an Oscar. That was pretty great. The only exception we made to the Oscars was the year Return of the King won 11 of 11 Oscars. My wife has been reading LotR every year since she was a teen. we watch the trilogy every year, even starting a Thanksgiving tradition of watching the extended edition version of the trilogy over Thursday-Friday-Saturday. So the year it won was also the year of Seabiscuit. Now, my daughter, seven year's old at the time, had never seen Seabiscuit. But she was watching the Oscars with us, so she decided to root for the film about a horse, and it was up for 7 awards. It lost all seven, including 5 times losing to RotK. So all night, they would announce a winner, and my wife would cheer, and then Jo would cry. She was so mad at Teresa by the end of that night. Not only did her horse movie lose, but, her own mother seemed to delight in every loss. And that's how supervillians are made. Some of Green Book’s best friends are black movies. But yes there was a lot of good stuff. Giving out a recommendation for The Dragon Prince on netflix. It has non white characters, gay and lesbian relationships, and ladies in warrior roles. Also it is very natural. The diversity isn't forced at all. Only negative is the weird frame skipping they use which sometimes feels like it is going to make me sick, but I got use to it by the second season. Probably the most diverse show I seen since the new She-Ra. The even have interracial relationships both gay and straight. So there's this show on Fox called The Masked Singer, where various entertainment personalities hide their faces and perform songs and the audience and judges tries to figure out who they are. Well, a Twitter person I follow suggests that The Bee appears to have taken Bonnie Raitt's "I Can't Make You Love Me" and appropriated it as a plea to white america on the anniversary of Trayvon Martin's death. Watching it with that in mind, I can't see it any other way. So did you find an article on this or just notice the dates? I just was aware of the show from seeing clips of the Korean version on YouTube, so was aware when it first was announced compared to when it aired. And I’m not saying it’s impossible that the song was chosen because of the air date, just less likely if it all was filmed last summer. Sorry, I should have used quote. I was referring to kazooka. There you go. I'm a little conflicted on whether it was intentional, or whether somebody on set design went rogue or what. I have a hard time thinking that the hoodies would be something you would slip into that performance and accidentally evoke Trayvon. It's a weird costuming component for a high concept design. Racism in Dragon Ball. Goes beyond mr popo. Also pretty interesting take. The thing that gets me about Empire actor situation is how fast the police went after him. There have been multiple cases of white people lying to police on black people and nothing happens to them most of the time. Some of these cases have even ended in deaths. Given that the police are actively trying to shape public opinion before the trial (teasing that they have more evidence, selectively leaking bits of info), I'm still not 100% trusting them. This is the same department that vehemently denied running a black site that disappeared people and covered up the murder Laquan McDonald's murder. I'm trying to keep an open mind without getting into conspiracy theory territory. It is fun. And I can now tell which one's Scott Wolf and which one's Scott Foley. Mostly. Watching Gilmore Girls at the moment. During one of the town meetings. Someone wants to stop a protest on the grounds that protests aren't allowed or the town doesn't need protesters. Someone pipes up with a couple of good examples of positive protests one being Rosa Parks. The reply punchline being Rosa Parks was against buses. Kind of rubbed me the wrong way. Thought it was in poor taste. I didn't really understand it in context of why being against buses would make that a exception to the current protest. Or maybe they were saying rosa parks protest was silly. This show usually doesn't make me think this hard. One thing about the new star trek show discovery I noticed is the trend to have have evil characters as bi sexual. In tv in general good characters are almost never anything but straight or sometimes gay. Captain Jack from doctor who is the only good bi character I can think of. Not in any way defending it, but I think it stems from good guys being simple and good and black and white. Bad guys are complex and shades of gray. Which I think is why we love villians so much sometimes, since they seem more like real people. I suppose it is progress that being gay is boring now. Brooklyn 99 has handled it pretty well in my opinion. The whole case has just been so bizzare. Got one site saying that there is a deferred deal in place, which is more an admission of guilt, and in no way "dropping all the charges"
His attorneys reached a deferred deal with the prosecution that will also have his record wiped clean. I haven't seen any statement from a Cook County official confirming all charges have been dropped. I also read that the court documents have been sealed which is apparently unusual for this kind of case.